This free standing closet is perfect for when you are short on closet space but still need a way to keep your clothes and shoes organized. 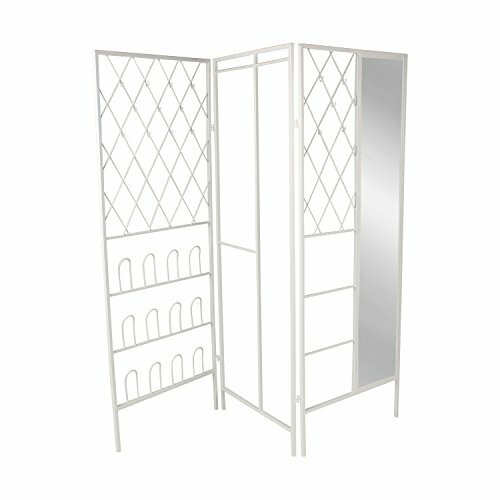 This organizer works in a bedroom with limited closet space as a decorative and functional folding screen. It also works in an entryway for extra coat, winter accessory, and boot storage. This folding metal organizer screen is constructed entirely of metal and has 3 panels, each 63 high by 23.5 inches wide. The first panel has 11 hooks on a decorative geometric metal pattern and room for 6 pairs of shoes. The center panel has 3 rods for hanging clothes. On e is 12 inches wide and has a hanging space of 29 inches and the one below that is also 12 inches wide with a hanging space of 26 inches. The third rod is 9 inches wide and has a hanging space of 56.5 inches. The final panel has 5 hooks on a decorative geometric pattern and a full length mirror with a surface 9.5 inches wide by 53.5 inches high. When fully expanded, the free standing closet measures 63 inches high by 71.5 inches across with a depth of 1 inch. This garment rack will help you organize your room and your life. View More In Shoe Organizers. If you have any questions about this product by Kate and Laurel, contact us by completing and submitting the form below. If you are looking for a specif part number, please include it with your message.